Services are integrated with Cloud Foundry by implementing a documented API for which the cloud controller is the client; we call this the Service Broker API. This should not be confused with the cloud controller API, often used to refer to the version of Cloud Foundry itself; when one refers to “Cloud Foundry v2” they are referring to the version of the cloud controller API. The services API is versioned independently of the cloud controller API. Service Broker is the term we use to refer to a component of the service which implements the service broker API. This component was formerly referred to as a Service Gateway, however as traffic between applications and services does not flow through the broker we found the term gateway caused confusion. Although gateway still appears in old code, we use the term broker in conversation, in new code, and in documentation. Service brokers advertise a catalog of service offerings and service plans, as well as interpreting calls for provision (create), bind, unbind, and deprovision (delete). What a broker does with each call can vary between services; in general, ‘provision’ reserves resources on a service and 'bind’ delivers information to an application necessary for accessing the resource. We call the reserved resource a Service Instance. What a service instance represents can vary by service; it could be a single database on a multi-tenant server, a dedicated cluster, or even just an account on a web application. How a service is implemented is up to the service provider/developer. Cloud Foundry only requires that the service provider implement the service broker API. A broker can be implemented as a separate application, or by adding the required http endpoints to an existing service. 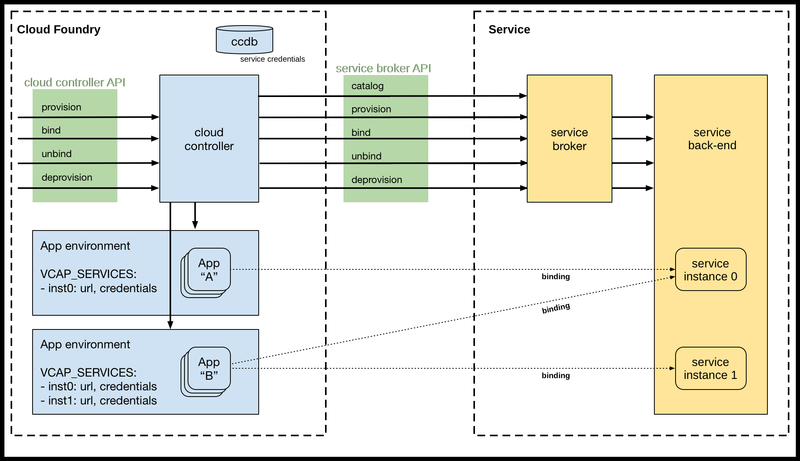 Because Cloud Foundry only requires that a service implements the broker API in order to be available to Cloud Foundry end users, many deployment models are possible. The following are examples of valid deployment models.